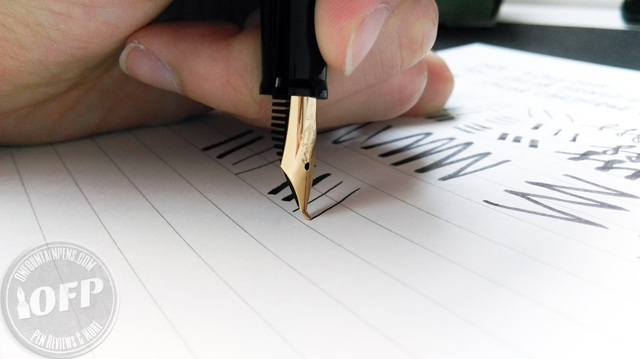 If you are looking for a special and exotic nib, try out the Sailor Fude nib. A couple of years ago, I bought this pen because it really fascinated me, but due to multiple distractions, it has been cast aside and almost forgotten. Such a pity! 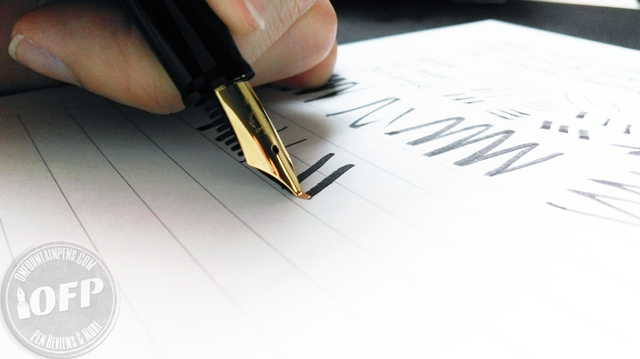 This pen is a Sailor Profit fitted with a Fude nib. By the way, it’s pronounced more like “fuh-deh” and not really “fewd”. 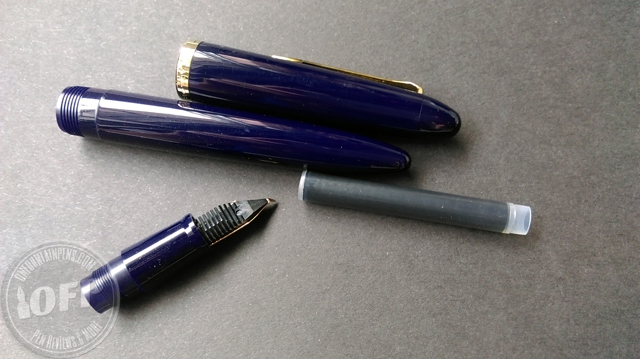 It is one of the more affordable, below 20 USD pens, which is a real delight for anyone who want to try one of Sailor’s exotic nibs but don’t want to detonate a bomb on the wallet. You can get it on Amazon as well. It comes in a cardboard box – don’t expect too much from the packaging department at such a low price point – but it protects the pen well. 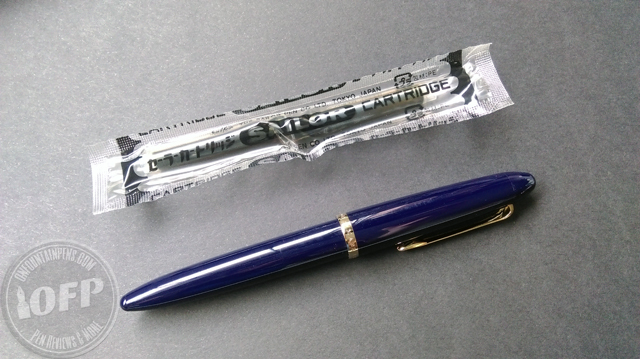 Unboxing it, you’ll get the Sailor Profit Fude pen itself, as well as 2 Sailor cartridges. Sailor cartridges are for Sailor pens only and you can’t use international cartridges in the pens. The pen is very easy to dismantle. Just unscrew the cap, unscrew the barrel, plug in a cartridge, and screw all the parts back. 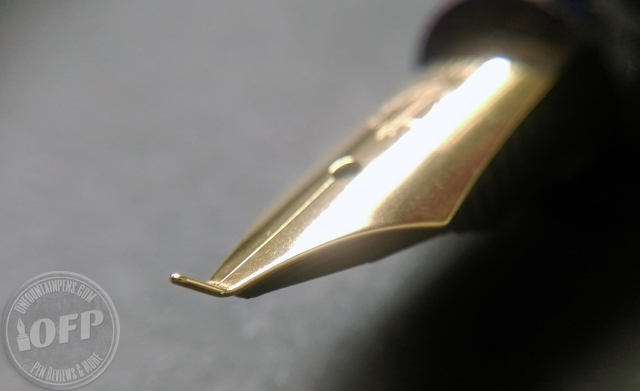 This nib has a rather steep kink at about a 55 degrees angle. I haven’t compared similar nibs of other angles, but so far I believe 55 degrees is the steepest angle. 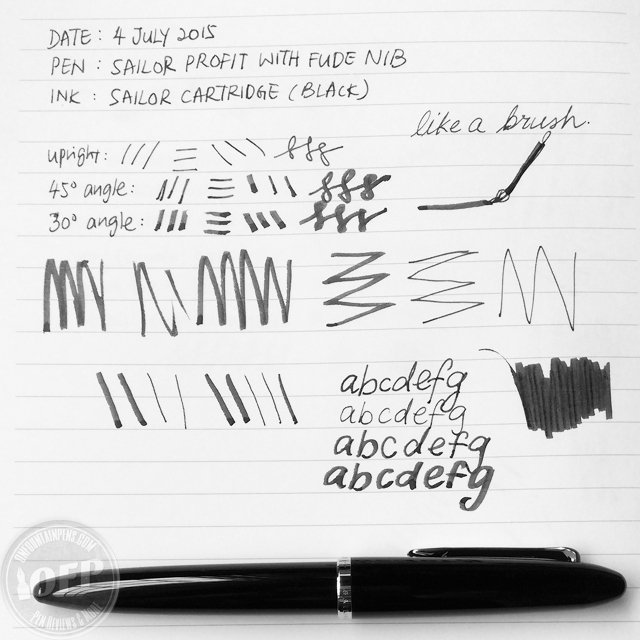 You can catch a picture of other fude nibs on Parkablogs. 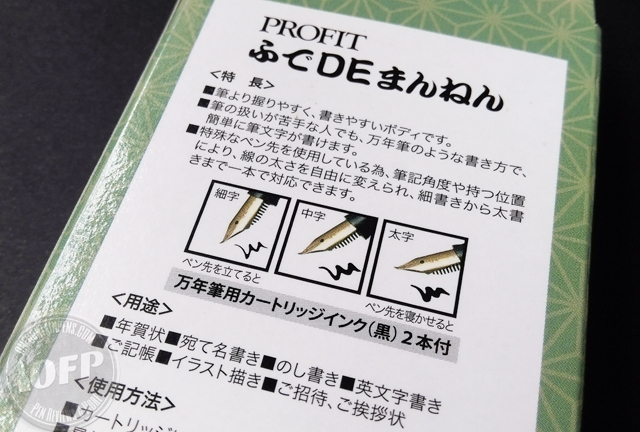 The pen is called “fude DE mannen” as written in Japanese characters on the top left corner of the box, below the word “PROFIT”. I wasn’t sure what “DE” means, but the words “fude” and “mannen” combined means something like fountain brush pen. This is exactly the purpose of this pen. 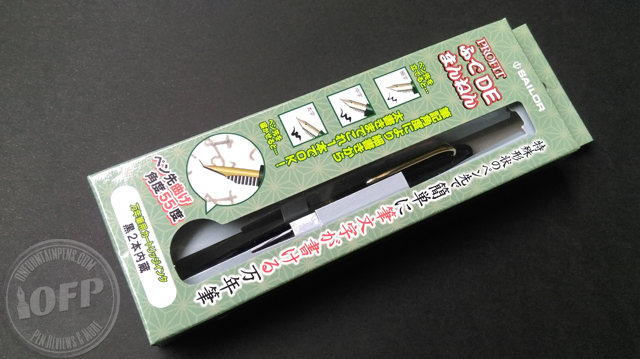 The pen can be used for writing Japanese calligraphy and the slanted tip allows the writing to imitate the experience of a brush. How, you may ask? Although you can get the nib in both steel and gold versions, I am quite happy with my steel nib. It writes with a little bit of feedback but overall I would say it is smooth. The ink flow is moderate tending towards dry, so initially when I used this pen for intensive colouring, the flow of ink could not catch up with the output for a while. But for normal writing, it has worked perfectly fine so far. Oh, the possibilites you could make with this pen! The thin lines can be used for drawing outlines, while the flat part can be used to fill in spaces with colours. You can even put highlighter ink into a converter and use it on this pen for highlighting! 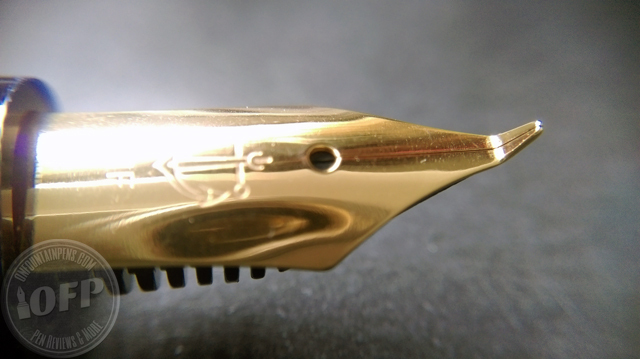 What an interesting nib! It kind of looks like a pen that was dropped straight on it’s nib then bent back a little. 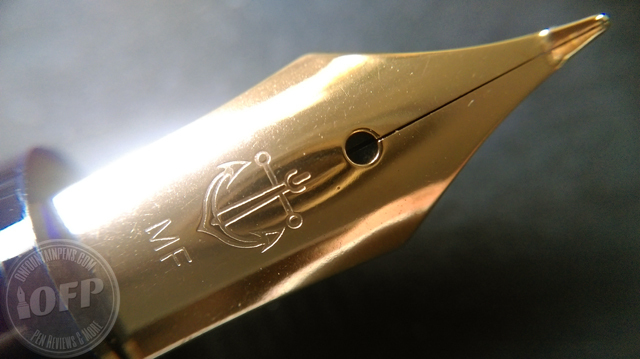 I don’t really like this particular nib because the performance really depends on the paper that’s used. On some paper, the ink flow is not good enough. I see, I can’t judge since I haven’t used other nibs before, but this nib produces strokes that really look quite like a brush, which I like!